"Right Turn or Left for Dead?" Great question, and a necessary one after Juliet discovered Shawn's secret during "Deez Nups." Did Shawn make a mistake he could be regretting for the rest of his life? Or did the revelation break down the final wall preventing Shawn and Juliet from really knowing each other? I really loved the structure of this episode. Setting up the reality in tandem with Shawn's imagined outcome was brilliant and almost had us guessing if Shules had really managed to work things out. Life is messy, and therefore Shules and their relationship has to be messy too. More importantly, each world gave us a glimpse into the real growth that Shawn has undertaken as a result of his relationship with Juliet, which it necessarily took both realities to see. Let's start with the reality he'd created in which he hadn't given Juliet the jacket. In this reality several negative things take place. Elin dies, the Chief gets sick, Gus suffers an allergic reaction to the biscotti. But then there are also good things that happen, too. Like Shawn making it to the shelter to get Lassiter his dog. But perhaps the most important thing about that world is how he paints the picture of his and Juliet's relationship. In this reality, he and Juliet are overly affectionate to the point you almost want to throw up because they are too adorable to handle. There's also the repeated references to Shawn and Juliet getting married. Juliet asks Shawn what a "Spencer-O'Hara" wedding would look like - "Rob-A-Bye-Baby," anyone? Then Juliet makes the off-hand comment about how that little park bench by the stream would be a perfect place for a girl to get proposed to. Realize this is all taking place in Shawn's head, which means he is more or less making these things come out of Juliet's mouth. This means he's thinking about those possibilities - those commitments - which is a tremendous thing for Shawn to be considering. This is definitely worth keeping in mind. In the real world there is one less body because Elin lives. Similarly awesome, Henry and Lloyd are hanging out. But there are just as many valuable Shawn takeaways. Shawn is clearly devastated at the rift that his deception has caused between himself and Juliet. He even goes as far as to confide in his father, which is clearly an indication of how evolved their relationship is. This is essential. It was also important that Shawn actually took Lassiter and Juliet to the crime scene. Clearly this reveal will cause Shawn to rethink what he's divining from now on. What dumbfounded me, but was completely necessary, was how inarticulate and just plan stupid Shawn was in a lot of his dialogue with Juliet. In the hospital one of the first things out of his mouth was asking Juliet whether or not she would keep his secret. Then in the final scene of the episode, he tells Juliet openly that he was just thinking about what would have happened if he had not given Juliet his jacket at the wedding. That sentence should have started with something about how he wished he'd told her the truth sooner so she wouldn't have had to find out from a piece of paper in his jacket. This highlights the severe problem Shawn was having at the end of "Deez Nups." Shawn framed his statement of the truth very selfishly. He left out the details that Lassiter was about to throw him in jail and so he "divined" a few things that forced Lassiter to let him go. He told Juliet that falling in love with her "wasn't part of the plan." It was supposed to be so much more heartfelt, but instead it just seemed callous. The same logic applies here. He should have qualified what he said. Shawn did better in his concussion-induced nap where Juliet came in and asked to be let to finish before Shawn chimed in. I loved that speech. I wish it would have been real. Maggie Lawson really knocked that moment out of the park. Shawn's response was right on target. Then he woke up and blew it. I almost fell off my chair. He had said everything in the dream that he needed to say out loud. It was so frustrating to watch him let the moment slip through his fingers like that! If I was Juliet, I would have broken it off with him, too. I just simply have the luxury of observing and analyzing their relationship to the point that Shawn's actions make sense. The way Shawn keeps sticking his foot in his mouth...it's just embarrassing. The best part about these two realities is that while one comes true and the other doesn't, one is reflecting Shawn's psychological state, which demonstrates his willingness to commit and consider moving forward, while dealing outwardly with the consequences at hand in the other. It's just a shame he can't manage to get his mess together. Now we'll be forced to watch him move out of the house Shules shared. That's going to be so rough! Lassie and Lassie junior. 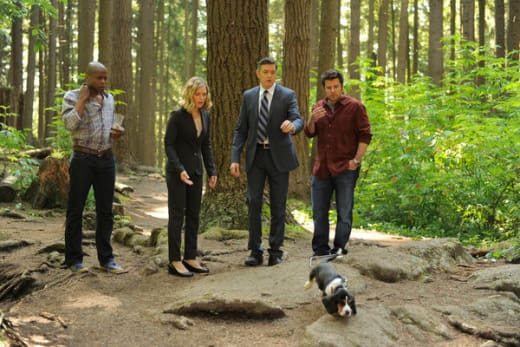 I really wish Lassiter would have gotten that dog. Woody having taken all the gift bags. Gus' allergic reaction in Shawn's alternate reality. No wonder no one took him to the hospital. Shawn doesn't think that far ahead! Shawn and Gus' Swedish accents. Priceless. Shawn getting run over by a truck and managing to survive. I'm still trying to figure out what the point of that was, but it was awesome. The whole concept of splitting the realities and letting them both play out, even if one of them was real. Shawn's repeated use of Siri. Someone has upgraded to an iPhone 5. 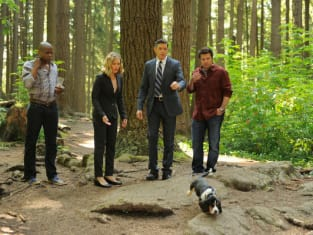 So Psych-O's, what do you think will happen when Juliet gets a new roommate that wants her life? I wish them exactly 7.2 years of happiness. Permalink: I wish them exactly 7.2 years of happiness. Did you consider going Costanza? Permalink: Did you consider going Costanza?